You probably have a closet full of shift dresses and flats that can pull your outfit from day-to-night fast, but make some room and grab some extra hangers because the pencil skirt is another closet staple that can just as easily work overtime for you. At first glance, the pencil skirt might make you think of a conservative relative you try to avoid at Christmas parties, but take a closer look at all of the variety it offers and you’ll wonder how you ever lived without it. 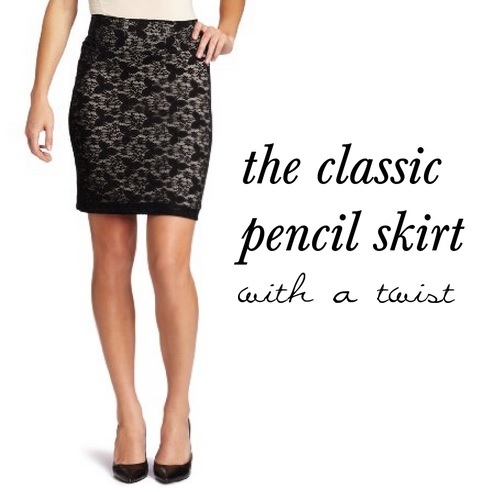 From denim to tweed, the pencil skirt is as perfect for an interview as it is for a first date. A tweed pencil skirt with tights is appropriate for the colder winter nights, while a bright solid and some expert colorblocking will bring you back into fall. 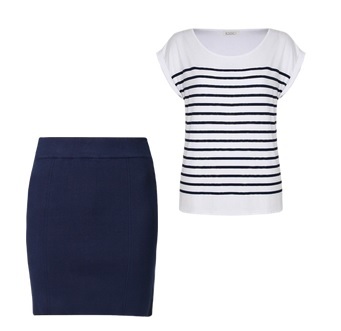 For a more casual look, try a denim pencil skirt with a striped nautical themed tee-shirt and a solid cardigan over it. You’ll feel sophisticated and cute without looking too stuffy or fancy for an everyday look. For more special occasions, the pencil skirt can often act as a unifier, tying the entire look together. Pair a fun sweater with a solid black pencil skirt, lace tights, heels or boots, and you’ll stun your date on Valentine’s Day. While it doesn’t have to be the center of attention, this skirt certainly can be. If you choose a pencil skirt with a detail like peplum, it will surely garner attention. Pencil skirts also have benefits in their design, by highlighting the narrowest body part with a band at the waist; you’ll appear tiny and the length will elongate your legs. (Not like you needed help with either of those!). There are some awesome end-of-season sales going on in January, so get out there and add a few pencil skirts to your wardrobe. Jordan Schuman is one of my favorite writers on CG..Love her story ideas and the way she presents them.